It all starts with a passion for learning, surfing, and marine biology. CIT is a common acronym in the youth camp industry. It stands for Counselor-In-Training. Sometimes it is referred to by other names (Jr. Instructor, Leader-In-Training, or Counselor Assistant to name a few) but the concept is generally the same; expose excited return campers to the professional side of the “Camp World”. Camp counseling takes a specific type of person but the skills learned as a CIT have real world applications. 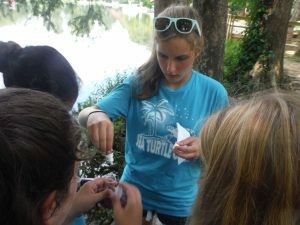 These programs allow campers to see what it takes to work in this field and give them opportunities to experience and develop some of the responsibility and leadership involved with being a counselor. Learn and teach about ecology, water quality, and wave dynamics. Though designed with the intent to help campers discover a new passion for camp counseling, these programs are excellent for professional development and personal growth outside of this specific field. We are training our campers in peer leadership, public speaking, self-confidence, and lesson preparation and delivery. We expose them to the necessity of “rolling with the punches” in a world where schedules and conditions are directly related. Employers today are looking at more than just education. Professional recruiters will look at a CIT and see a young candidate that already has experience in necessary skills. In hiring, youth camps are looking for excited experienced professionals that will help them achieve their Mission. The most ideal candidates are people who have been exposed to their specific program. With a CIT program, your camper will be known to a camp and will gain some of that necessary experience before they even graduate from high school. Learn real world skills and make life long friends! CIT’s are campers. This is important to remember when selecting a program. WB Surf Camp is a new take on classic camp. Campers will build camaraderie, confidence, and have life changing experiences. At WB Surf Camp, our classroom is the beach, the activity is surfing, and the focus is conservation and marine science. At WB Surf Camp, we give CIT’s the background for teaching, surfing, and becoming a counselor. We give them practical opportunities to lead peers through scientific discussion with lessons on ecology, water quality, or wave dynamics. Most importantly, we will walk campers through our tested process for complex problem solving and decision making in a setting with little room for error. Come build confidence and independence. See if counseling, marine science education, or surf instructing is right for you. Join us for a life changing experience as a CIT for the 2017 season!